I love steampunk style, I must confess. I cannot say that I am a big fan of steampunk style literature and films - I mean, I do not try to see and read everything there is - but I love the style, the atmosphere and accessories. 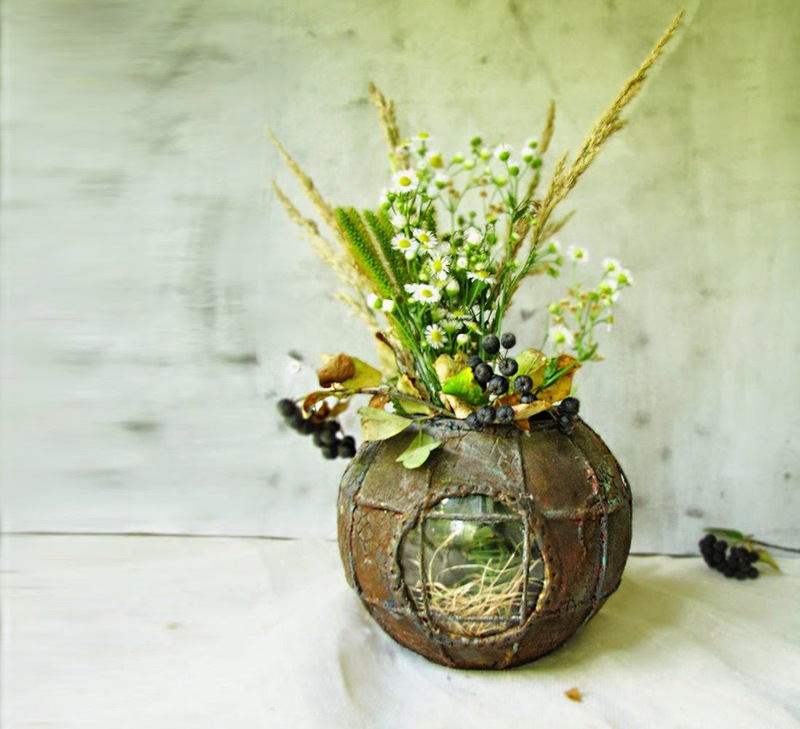 The mixture of modern and antique, the flair of Victorian style and the endless possibilities for recycling, upcycling and reusing have to appeal to me, as I love vintage things and the idea of re-using instead of wasting. And at times I feel a bit fed up with the glare and glitter of new things which are sold at clean glistening shops. I really long for something old, enigmatic, covered in patina and cobweb, and maybe bearing some unreadable inscriptions - secret scribbles - and where do I find that dark and dusty Old Curiosity Shop? Certainly not in my home city. But now, when we have Internet, we have more possibilities. Etsy Marketplace is one of them, and I love browsing it (yes, I am also a renowned window shopper; I try to buy less, but I enjoy browsing). Here I have a small collection of steampunk items from Etsy sellers who make things themselves. These are all real people who work from home, and I find their items much more interesting than faceless mass produced goods. 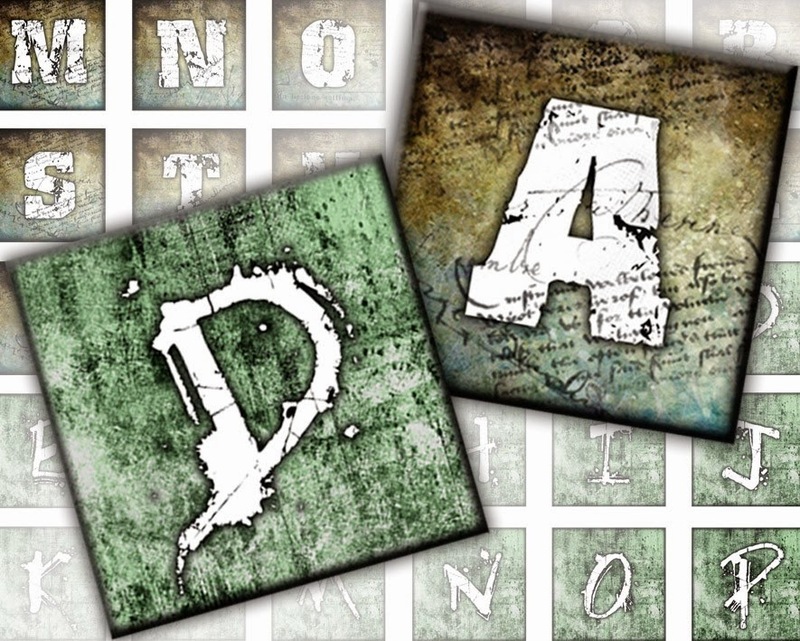 Downloadable steampunk alphabet letters. You might use them for a banner if you are having a steampunk party or wedding, or for some crafting, like for your own packaging. They were drawn by a professional graphic designer. I like their aged appearance. 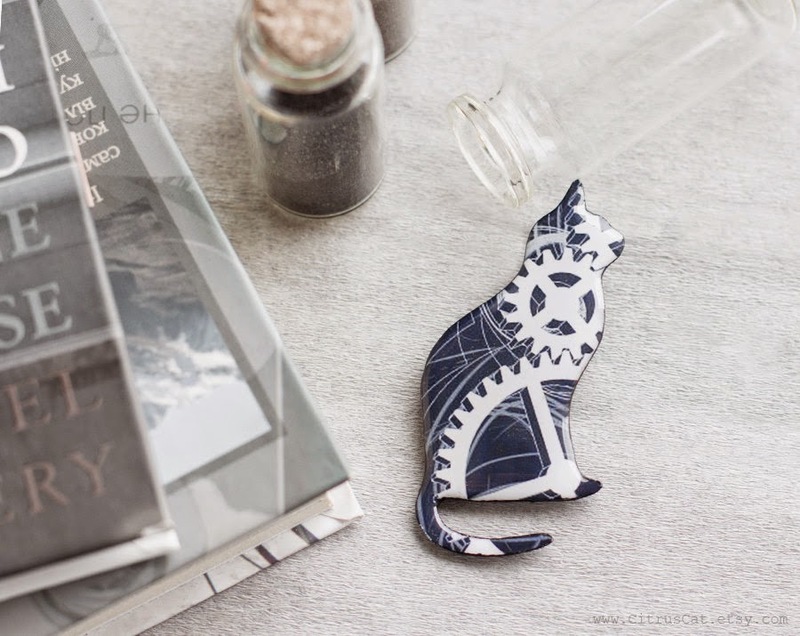 A mechanical cat brooch. The cat is full of gears and I think it is cute and funny. It would probably drink luboil instead of milk. Yes, I do prefer real animals, but a robo-cat is an interesting concept and looks beautiful. Just think of all tiny elements inside a living cat - all that complex mechanism which makes it alive - any robot will seem crude and clumsy. 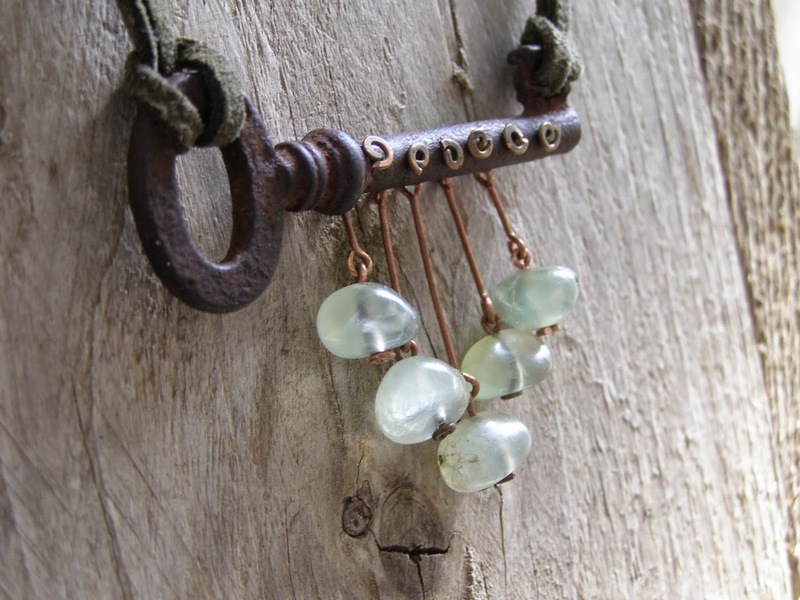 The combination of an old rusty skeleton key and smooth prehnite beads with their dreamy glow is irresistible. A very fine example of steampunk. It makes me think of things which deteriorate - everything made by humans, like this key - and the eternal life and beauty of nature. 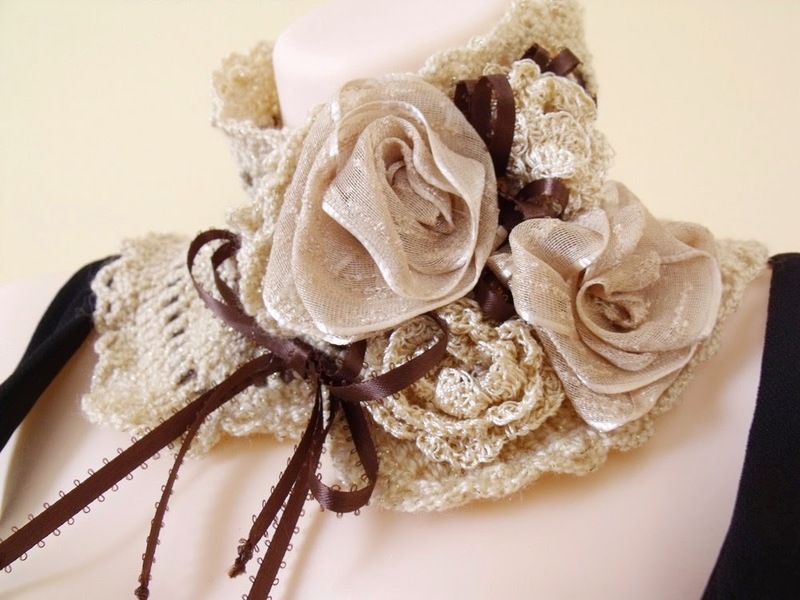 A very vintage looking lace cowl with decadent roses and ribbons, a perfect mix of pastel shades and textures. If I needed a steampunk costume, I would certainly want this cowl. In combination with a plunging neckline, it looks very edgy. This is a beautiful piece of jewelry which is actually forever. A timeless piece, it goes equally well with a suit or jeans and t-shirt. I love its wavy structure - an unexpected twist. It must be nice to wear it to the office, as something alive and different to complement that very formal attire. 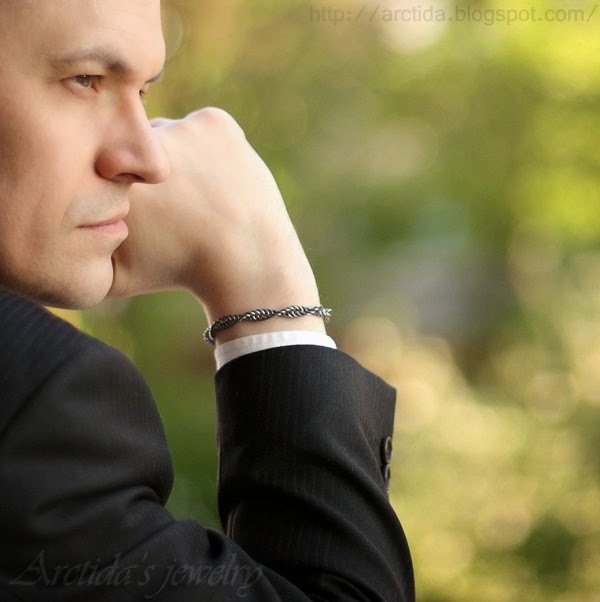 In the most boring meeting, he can look at his bracelet and think of you. 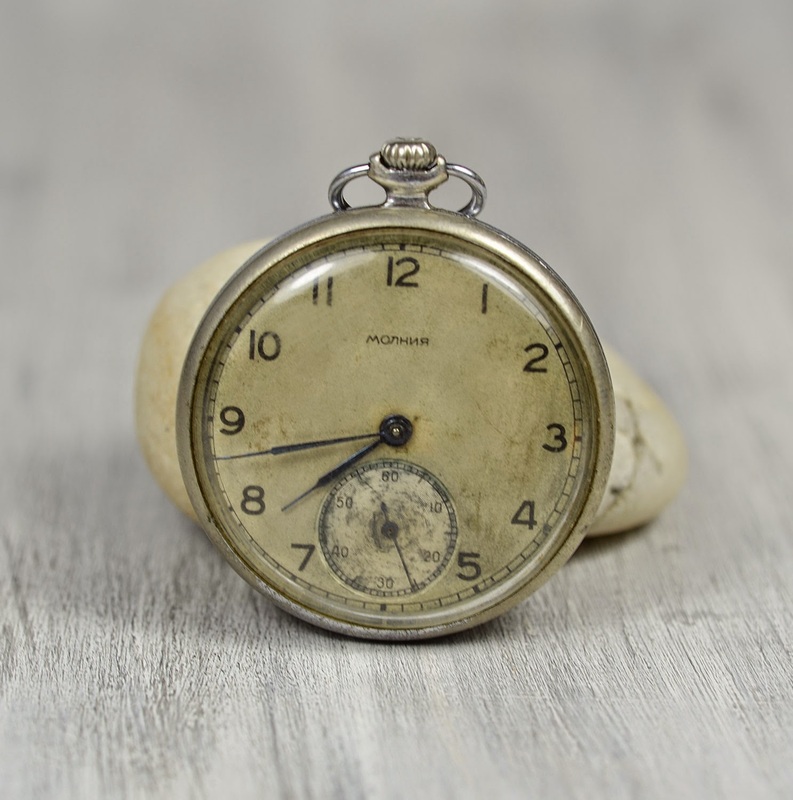 A vintage pocket watch is a must for a true steampunk lover. This shabby looking watch is from the Soviet Union which makes it even more interesting. Oh, there is a huge potential for writing post-Apocalyptic stories set up in the post-Soviet environment. Please do not take me wrong, I am fond of our history, but all those huge factories (many of them dead now), and mines (also many dead), and a number of dead towns (I have seen some of them) present a great environment for writing, filming or just walking around and taking pictures in steampunk style... if you are not too afraid. So, vintage Soviet pocket watch is a great steampunk find! The bathyscaphe vase. This is probably one of my favorite items ever. I adore the contrast of rough surface, looking like rusty welded metal, and smooth glass. The round window provides insight into the depths of unknown, dark and secretive. And above these gloomy secrets, above the rusty metal and cold glass, we have those flowers, so alive and lovely, like a symbol of nature which survives the unreasonable humanity. Ah, the stunning bisque doll twins. They are so pretty and innocent, certainly there must be some mischief in them, and twins are always special, are not they? Sometimes they look quite eerie. 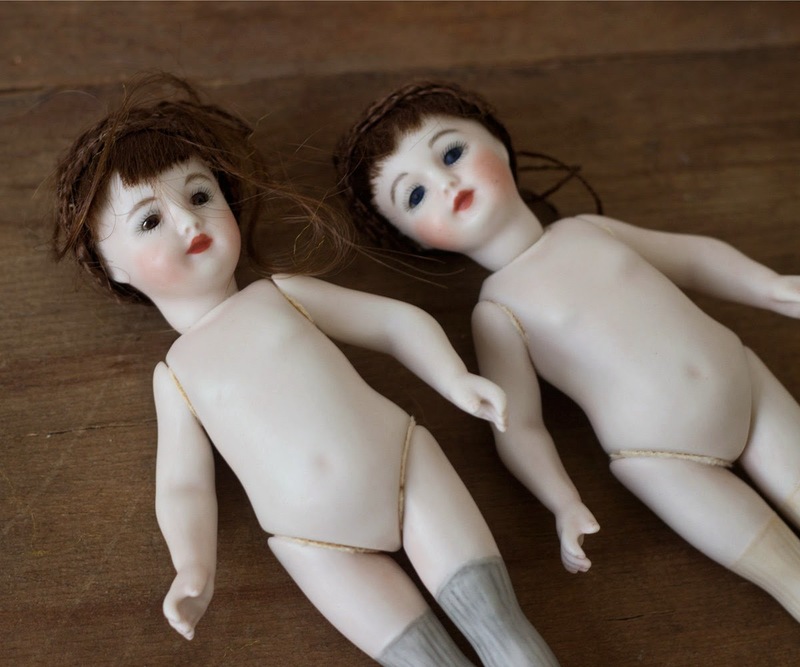 These are vintage replicas of much more old mignonette dolls, and they are exquisitely beautiful. No, I do not expect them to turn into blood-sucking monsters, they are just artist hand made dolls, but unusual and with lots of character. The painted stockings do make them look a bit strange, in my view. All for the better. Great article and very lovely finds. Thank you very much for choosing my cowl / scarflette and placing it among such amazing works of great masters of art.